McMaster: "I'll add one more thing: the president wasn't even aware of the source of the information. He was never briefed on it." Isn't this a problem? If an ally passes along highly sensitive intelligence to the United States within the strictures of a do-not-share understanding (whether tacit or explicit), shouldn't the president know enough about the information's provenance as to not accidentally risk compromising that relationship? If he wasn't briefed on this aspect, why not? Is it possible that his briefers are taking shortcuts because Trump isn't taking his briefings as faithfully and seriously as he should be? Many conservatives were incensed that President Obama reportedly skipped many in-person national security briefings while in office -- including on days like this. Imagine if he'd let an important detail slip during a meeting with a foreign adversary as a consequence of his questionable, under-briefed intelligence consumption habits. How would Republicans have reacted? If you wouldn't have shrugged then, you shouldn't shrug now, and vice versa. (2) Last night, the denials from both McMaster and Sec. Tillerson dealt primarily with allegations not made in the Post story. Trump had neither discussed nor disclosed intelligence methods, sources or classified military operations, they each averred in prepared statements. But that wasn't what Trump was alleged to have done. He was alleged to have shared secret information provided to the US by an allied nation, potentially compromising both the source of the intel and weakening America's relationship with that country. Today, McMaster expanded the scope of his assurance, asserting that the president "in no way" even compromised intelligence sources or methods -- which was the greater fear expressed by the Post's unnamed sources. According to McMaster, zero unknown information was divulged, nor did Trump's disclosures put any intelligence-related relationships or sources at risk. What Trump said, and the circumstances in which he said it, was "wholly appropriate," he reiterated several times. The National Security Adviser speculated that certain White House officials may have contacted the CIA and NSA following the Oval Office gathering out of "an abundance of caution," rather than as an urgent clean-up mission. There was no "lapse" in national security, he said. But how does that square with this detail? BREAKING: European official to AP: Country might stop sharing intel with US if Trump gave classified info to Russian diplomats. The president's ignorance and recklessness, or anti-Trump forces' overwrought, politically-charged leaks (or some combination thereof), are undercutting America's reputation as a reliable intelligence partner. That's a serious concern. By definition, the President did not "leak" to Russia. He disclosed. Our allies and partners must have the utmost confidence that sensitive information they share with us will not be disclosed. For the purpose of transparency, the White House should share a transcript of the meeting with the House and Senate intelligence committees. Regardless of what was shared in the meeting, it's dangerous to believe that Russia can be a reliable counterterrorism partner. So where does all of this leave us? 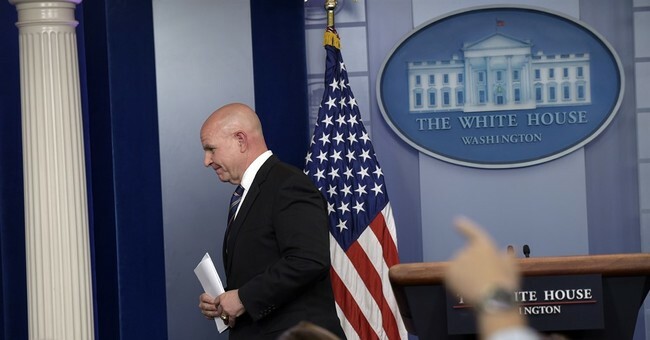 McMaster has an excellent reputation as a serious person and patriot, so his avowal that Trump did not overstep with the Russians last week provides some relief. He was in the room, after all. But I suspect that this story isn't over yet. Three possibilities remain, as I see it: First, that Trump didn't do anything remotely inappropriate. Second, that he very obviously screwed up, and that McMaster is serving up distortionary spin to protect his boss. Third, that the central question of this controversy rests on subjective judgments -- with one side of the debate perceiving Trump's disclosure as relatively harmless and routine, and the other side insistently viewing it as neither. If I had to bet, I'd choose door number three -- and determining which side's impression is closer to the truth will likely require more information. Which probably means more leaks, which are slowly consuming the Trump administration.